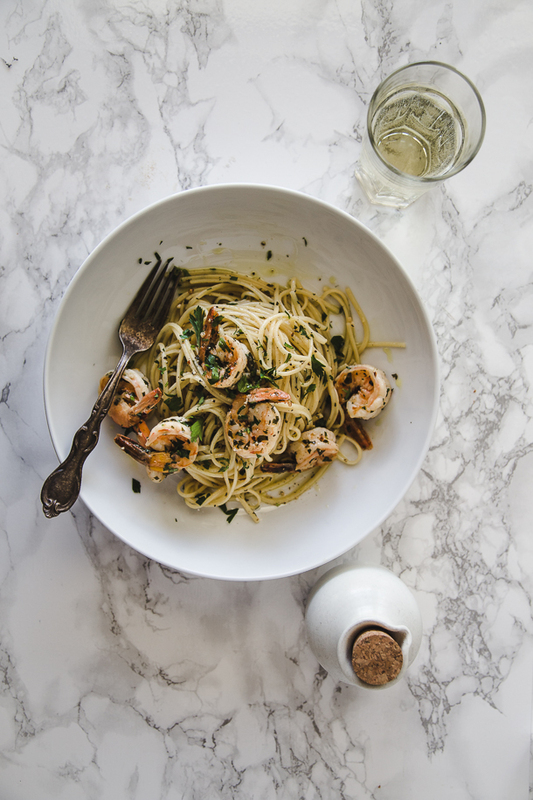 Shrimp scampi is essentially just shrimp that is cooked in a white wine and garlic butter sauce. It doesn’t actually have to include pasta like I chose here. You could serve this with anything you like really. It could be regular or gluten free pasta like I did, or it could be vegetable noodles, or it could simple be served with vegetables or atop some steamed rice. This is actually a great throw together weeknight meal but it tastes and looks like hours in the kitchen. A true win win. Also I don’t know if y’all have noticed but I actually recently started this new series called Cooking Isn’t that Hard. It’s essentially a little series I’m doing to show the ease of cooking to get people back in the kitchen cooking from scratch again! You can click here to see my youtube channel if you’d like to see all of the episodes that have been published so far. If you’re enjoying them I would really appreciate it if you subscribed to my channel on youtube that way you’ll get updates for when I upload the next episode! Heat butter and 1 tablespoon olive oil over medium heat until butter is completely melted and bubbling. Add garlic and red pepper flakes. Stir to incorporate, saute for about 30 seconds or until fragrant. Increase heat to medium high and add white wine and lemon juice. Once it comes to a boil add the shrimp in an single even layer so that all the shrimp lie flat on one side. Keep heat the same and boil for 2-3 minutes, then flip all of the shrimp to their other side and cook for an additional minute. Remove from the heat, season with salt and pepper to your taste, then add the fresh chopped parsley. Toss to distribute seasoning and chopped parsley evenly. Serve with whatever you like! 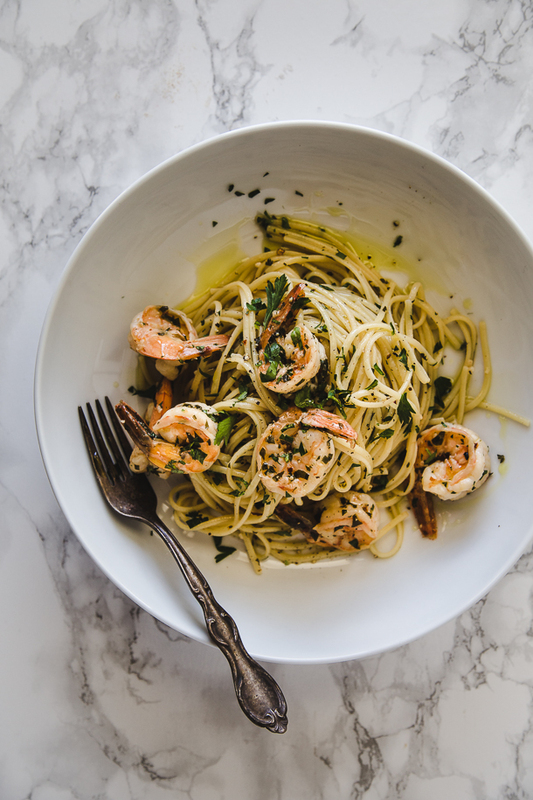 If serving with pasta, gluten free pasta, cook pasta according to package directions, drain, and add the pasta in with the shrimp scampi and toss to coat. 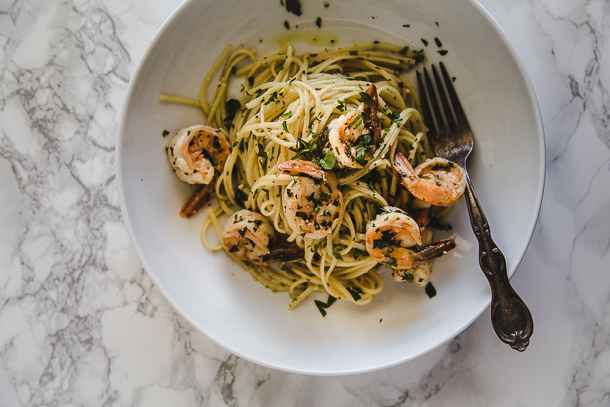 Do the same with zucchini noodles, sauce the zucchini noodles until they're cooked through before tossing them with the shrimp scampi. Or you can just serve the shrimp scampi with veggies on the side or atop rice or potatoes. When serving garnish with chopped parsley and olive oil. Enjoy! Couldn’t agree more to every word you write. I really enjoy your blog. Thank you so much !